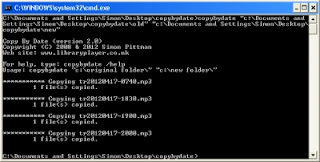 This is a simple command line tool that allows you to copy all files with the current date stored in one folder to another folder. You can set this software to run automatically on a server or computer every day (e.g. 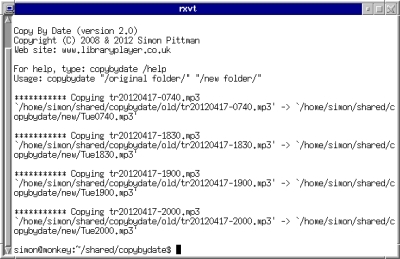 just before midnight) to automatically copy files from the past day. 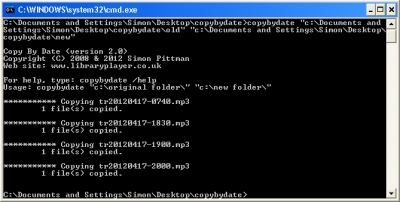 Since the copied files have just the day name and any time included in the file (e.g. Wed2230), any previous files will be overwritten. Before using the software, it is recommended that you read the documentation provided. Free for personal use and for use by registered charities. Versions of the software are available for Windows and Linux, and documentation can also be downloaded seperately. You should read the provided license agreement before using the software. If you require a version of the software for another platform (e.g. Mac OS X, BSD, etc.) or would like the software customised for your organisation, e-mail simon@libraryplayer.co.uk to discuss your requirements and pricing.